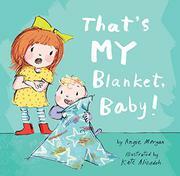 A new-baby book about a beloved old baby blanket—and a new one, too. Bella (illustrated as a white girl with brown hair) loves light-blue, star-patterned Blanket, which she’s had since she was a newborn. By the time her baby brother (also white) is born, Blanket is stained and smelly, muddy, and painty from all of the love she’s given it over the years. New Baby has his own blanket (his is light blue with white stripes), and although she loves him dearly, she thinks “she would love him even more if… / …he didn’t cry as much.” Bella tries to soothe New Baby, but it’s not until she does her favorite happy dance that he stops crying—when Blanket floats into his reach and he grasps it. “ ‘Oh dear,’ said Bella. She wasn’t sure what to do.” Rather than simply taking Blanket away from him, Bella encourages New Baby to bring his blanket to all sorts of fun activities that will make it as loved as hers is. “And when you have grown as big as me, Baby, you will love your blanket ALMOST as much… / as I love you,” Bella tells New Baby as they cuddle under both blankets, together. While the pictures do little to expand on the text, their soft aesthetic creates appealing characters at the heart of the story.